Today’s project was a struggle! Thankfully, I can report that it ended happily, but it was a long process getting there. 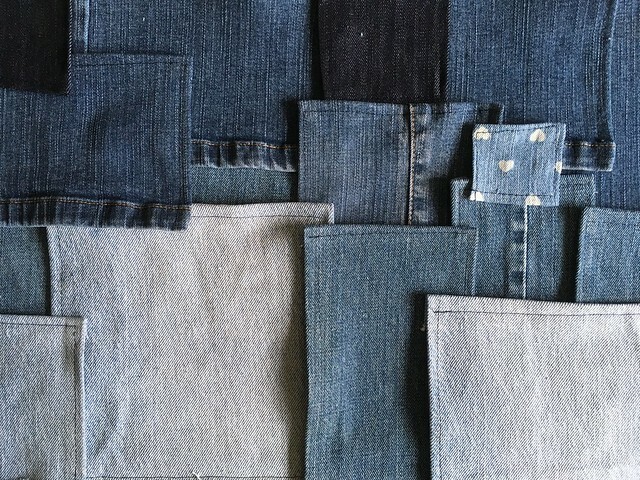 The challenge: could I make jeans I liked using the denim I had, which was less than what the pattern called for? 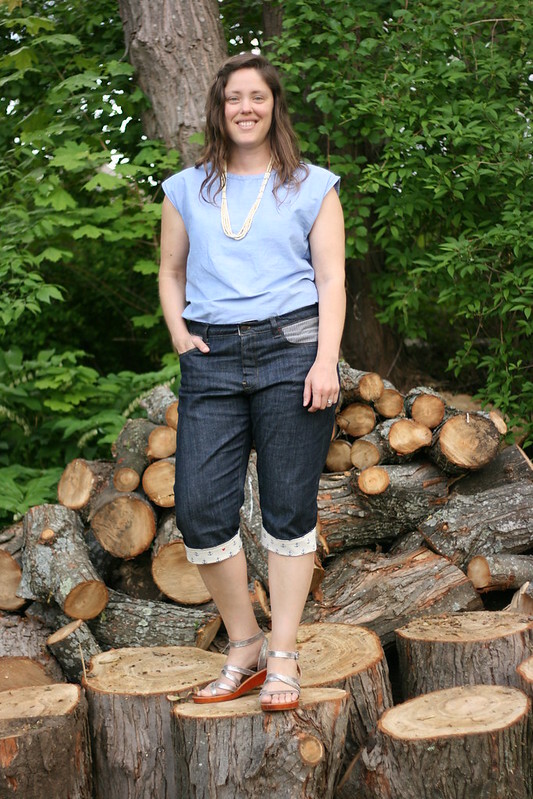 Armed with my Denim Pinterest board and ideas from the Refashioners 2016 jeans challenge, I was ready to take this one on! 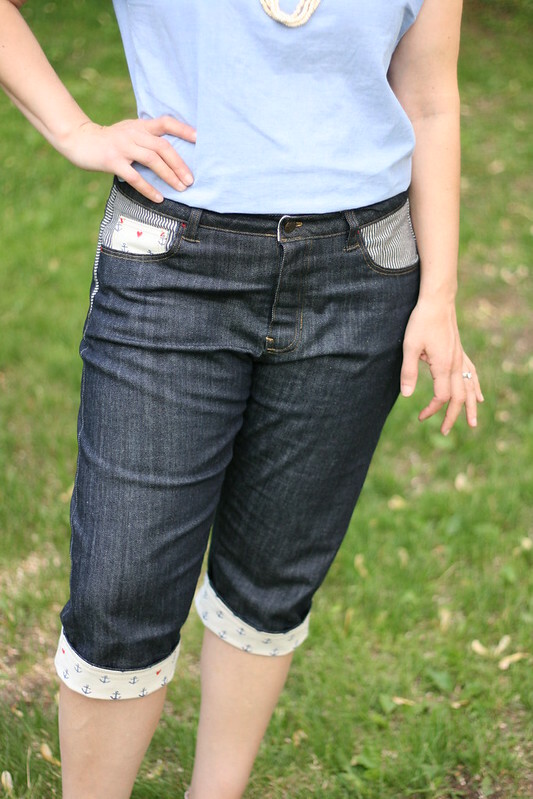 I decided to use the Morgan Boyfriend Jeans Pattern from Closet Case Patterns since I had non-stretch denim. Idea one was all about a casual, patchy look. I love clothes that are casual, lived in, and durable. 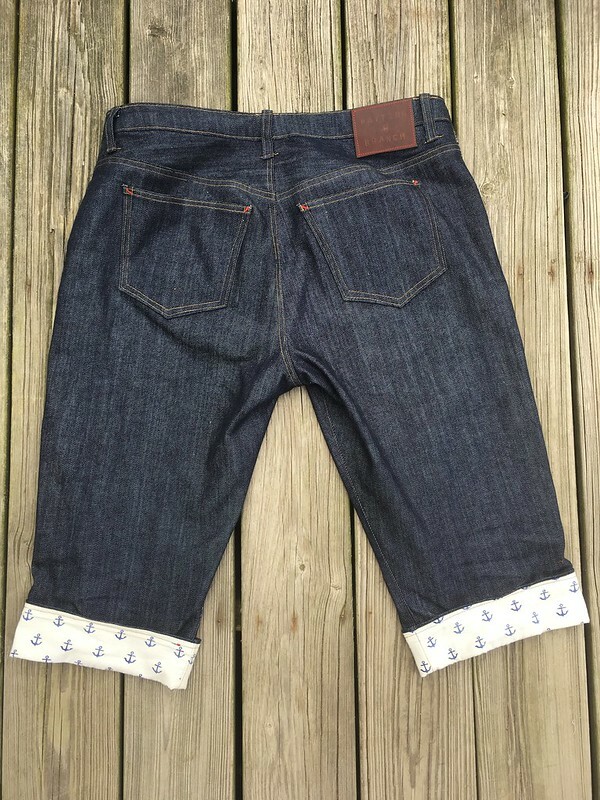 I decided to cut as much of the top of the jeans as I could from the denim I had left over from my Jutland cutoffs from last year and my Lander Pants. 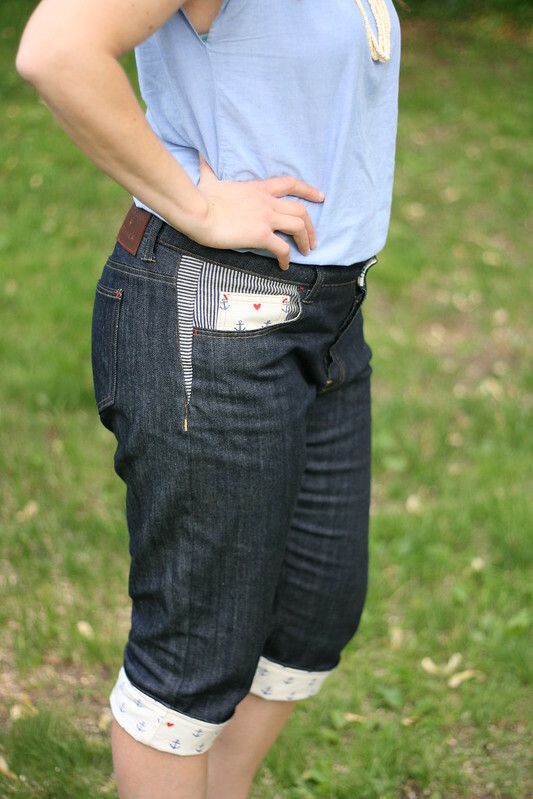 I would use the worn out jeans we had around the house (kept for patch jobs) to construct the bottoms of the pants. This seemed like a great idea, and looked really cool on my sewing table. Unfortunately, when I put them on, my cool, patched legs became something akin to denim leg warmers attached to jeans made of thin and much more flexible denim. 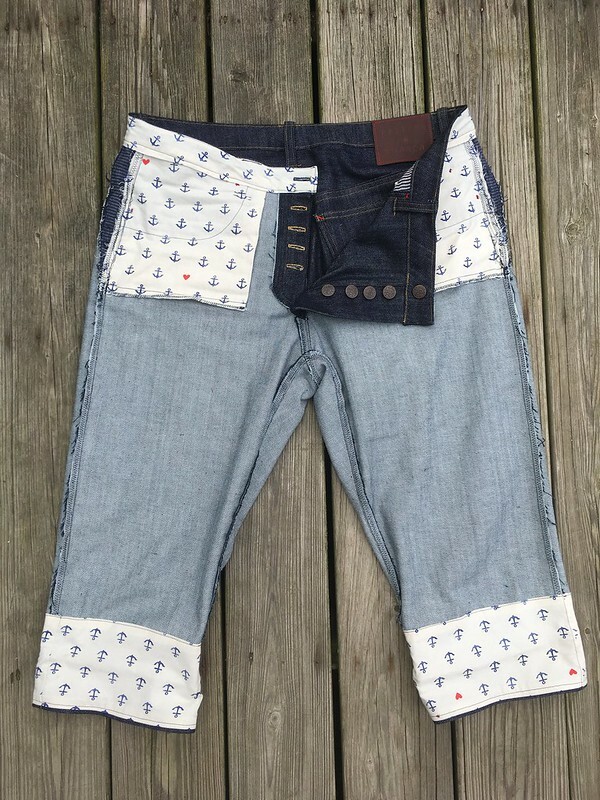 On the advice of some very wise friends who, although not sewists themselves, often help me troubleshoot my projects, I took the pants bottoms off, and moved them up higher so the pants would end around my ankles. 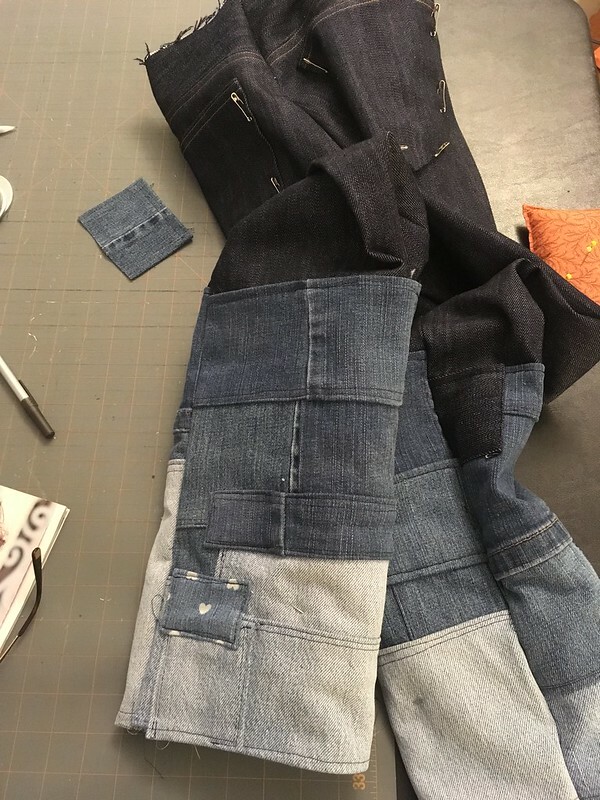 Everything looked good on the work table again, but when I put them on, the denim leg warmer look was back, and it wasn’t a good thing. It was time to abandon that idea. 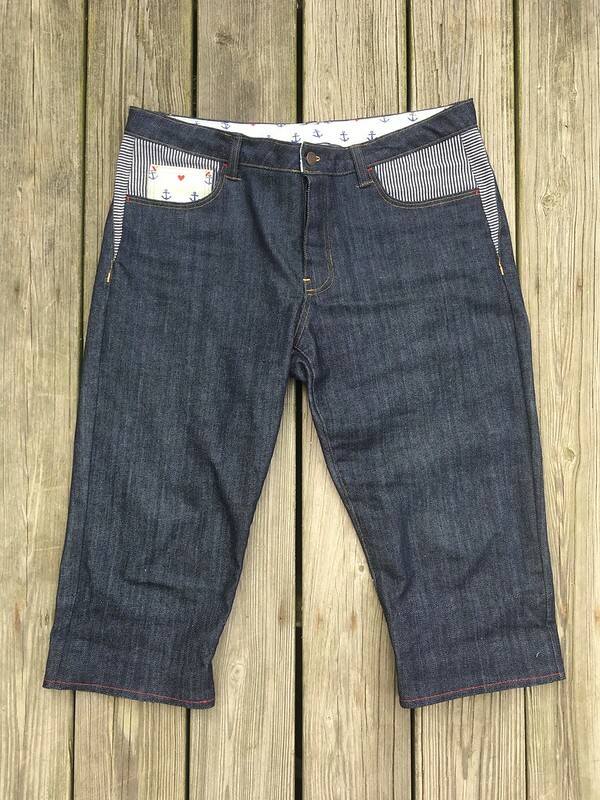 Option two was cropped pants with a raw edge, back slightly longer than the front. 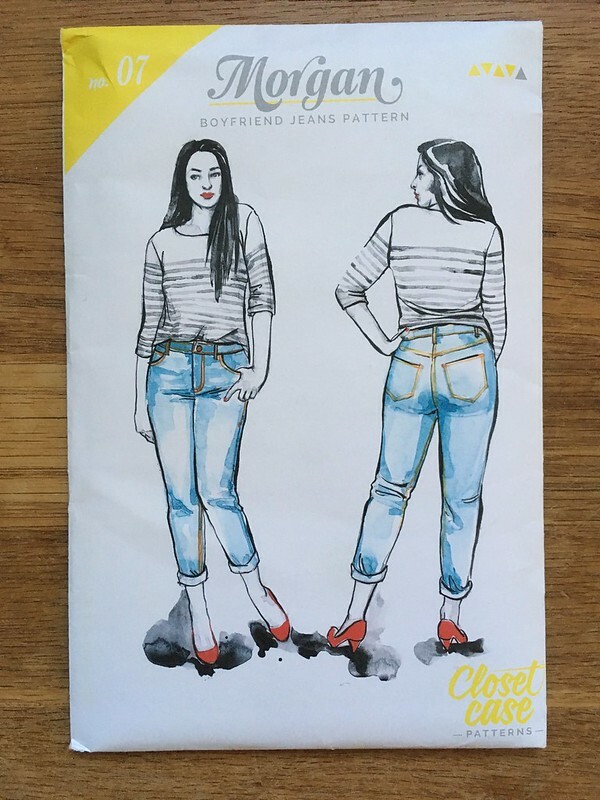 One look told me this wasn’t a good option on these particular jeans. Time to come up with a third option. At this point, my eldest daughter had a great idea. 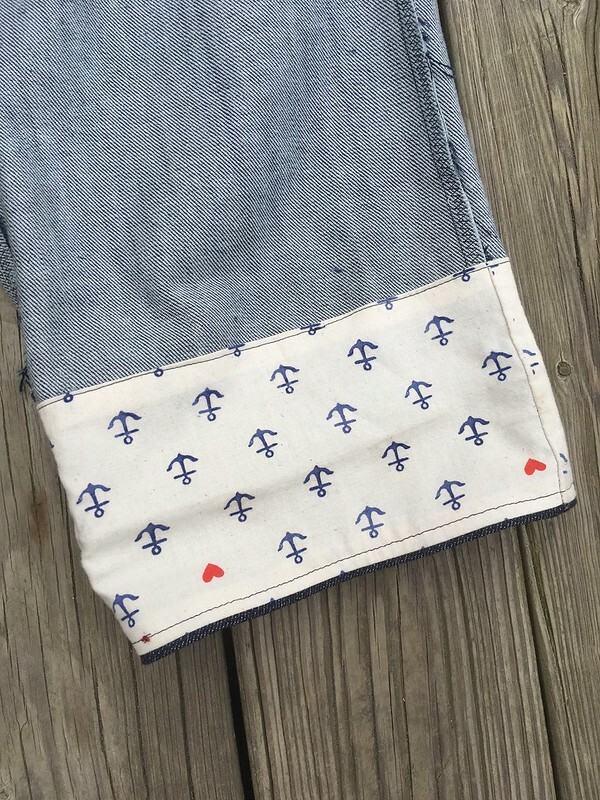 I could use some of the anchor fabric I was using for my pocket bags on the inside bottom of my pant legs so that I would have cropped pants that could be rolled up to reveal the cute print on the fabric. I loved this idea! It wasn’t too hard to execute, and it looked great. 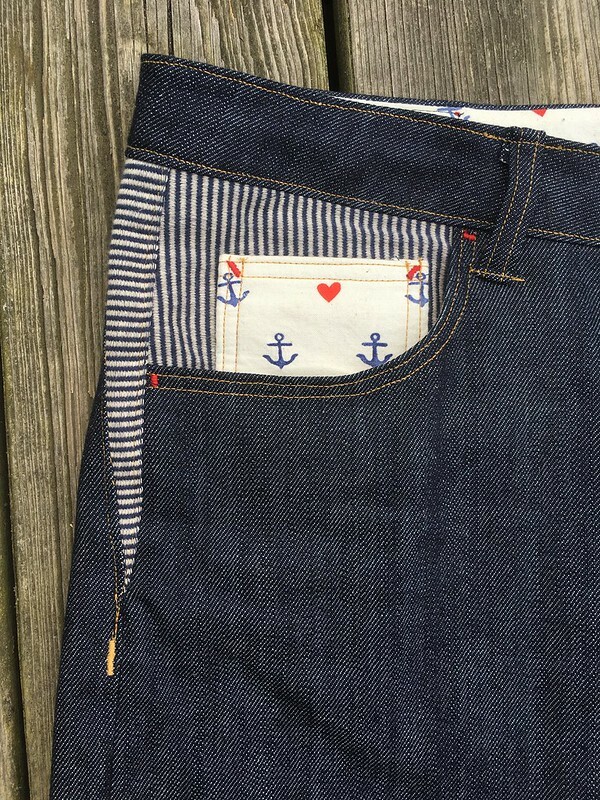 The fabric, with its cute anchors and hearts is directional, so I had to think about that as I planned it out. Thankfully, I got it right the first try. 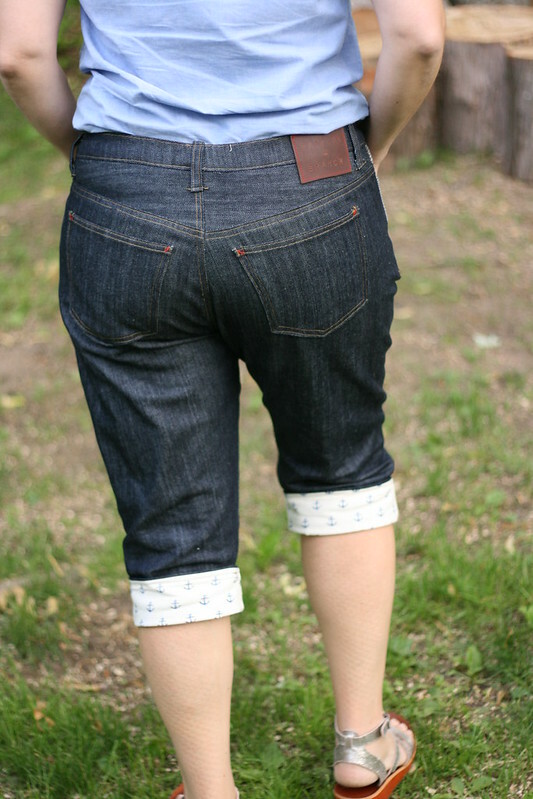 The pants are shorter than most cropped pants you see today, but I like them. They are great for spring and cooler summer days. Things were finally on track. I just had to put on my waistband and back pockets. I put the waistband on and…they didn’t fit. And I had trimmed my side seams. Oh no! I tried letting the side seams out the little bit that I could, but it just wasn’t enough. I couldn’t understand it. 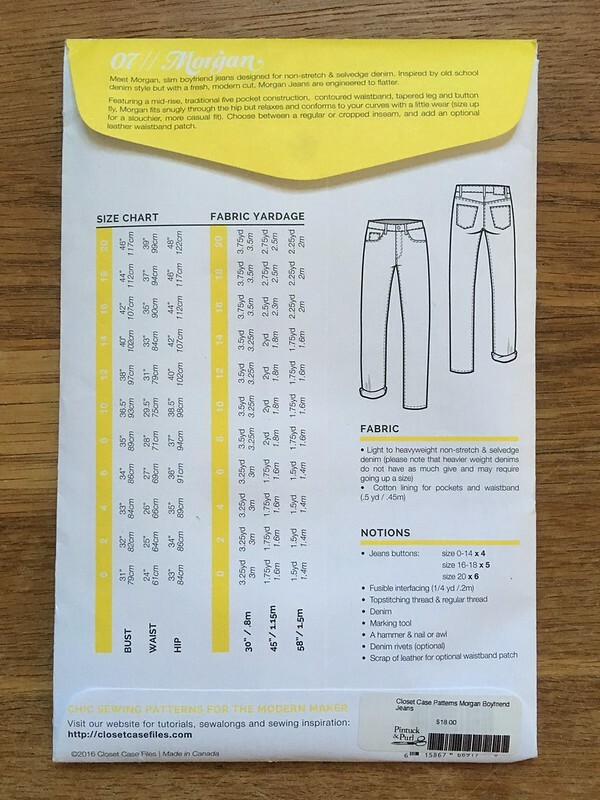 I thought they had fit, but when I really examined what I had done, I realized that I must have been close to a 14 waist or between sizes, so I traced a 14 waist and 16 hip when I should have just done a straight size 16. I wanted to give up, but I was so close to being done. I decided to try one more thing, and if that didn’t work, I would give the pants away. 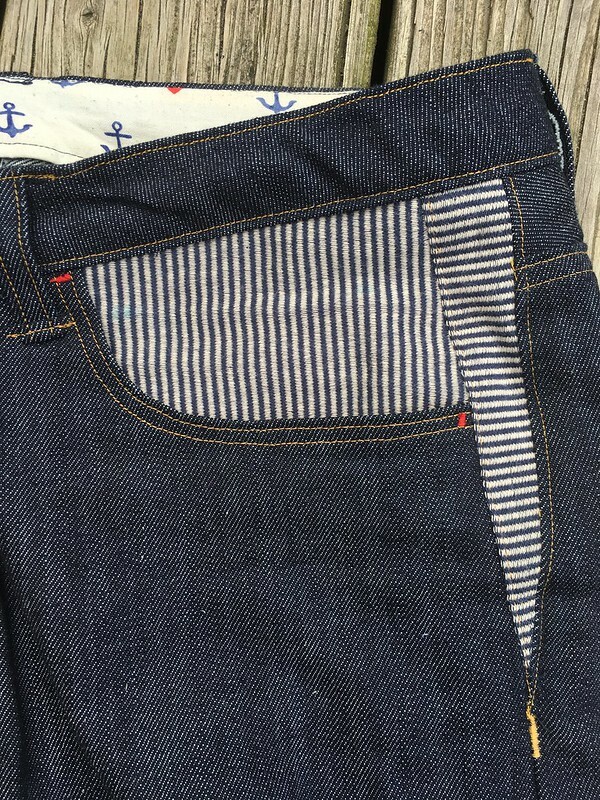 I added little triangle wedges at the top of each side seam using the same striped fabric I had used in my pocket facings, but turning the stripes perpendicular. 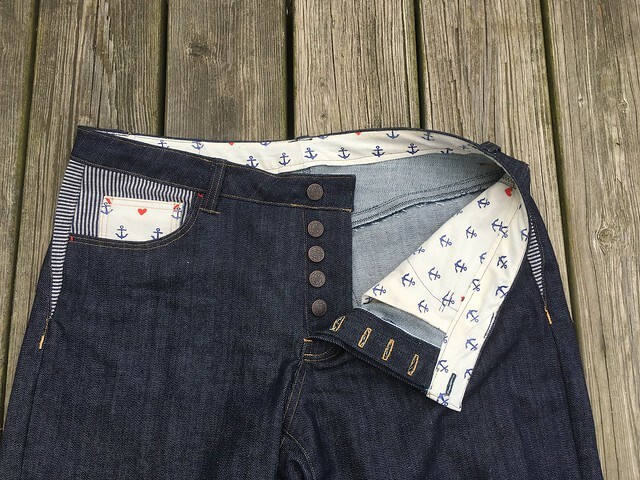 I lengthened my waistband at the end so that I wouldn’t change the curve (I had also added a dart at the center back to prevent gaping, and I didn’t want to change that either). Then I finished everything up, tried them on, and…THEY FIT! They fit well! And they were pretty cute! I was so happy. 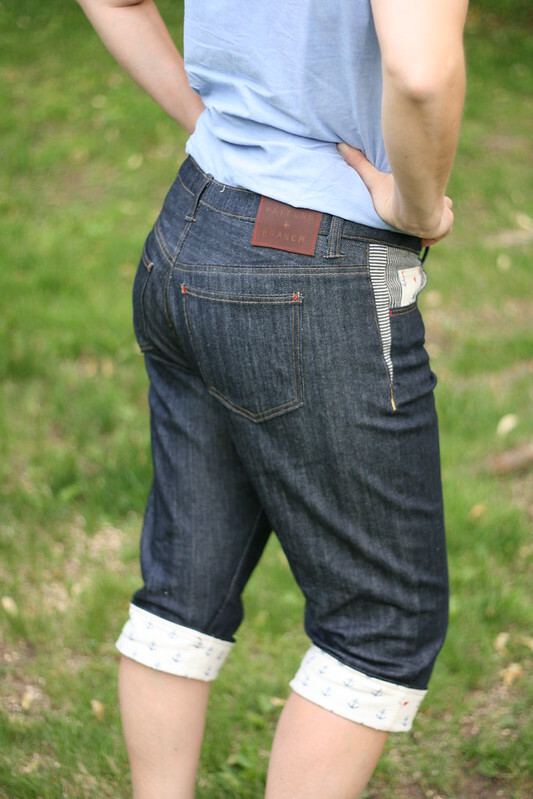 I think I seam-ripped everything on those pants at least once–more in a lot of places. 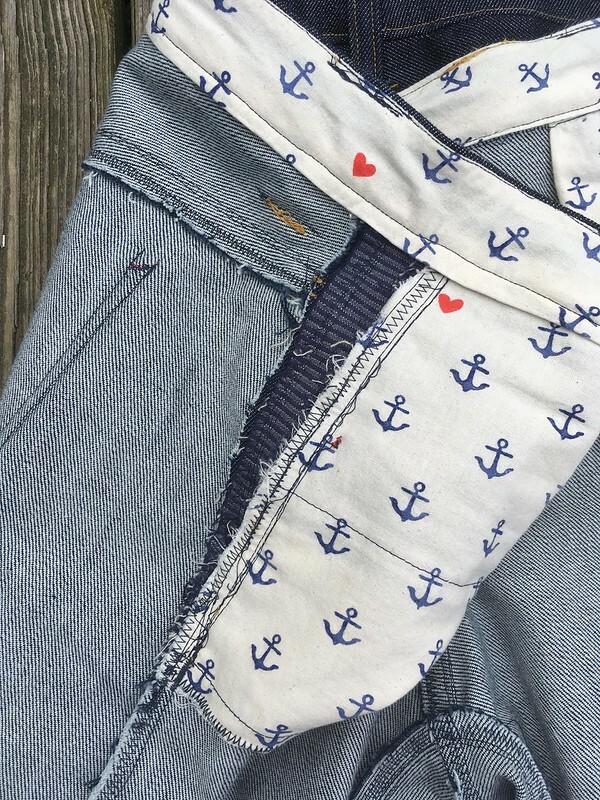 I am so, so glad they are done, but also really happy to have a pair of fun jeans that I like, AND to have used up so many scraps. 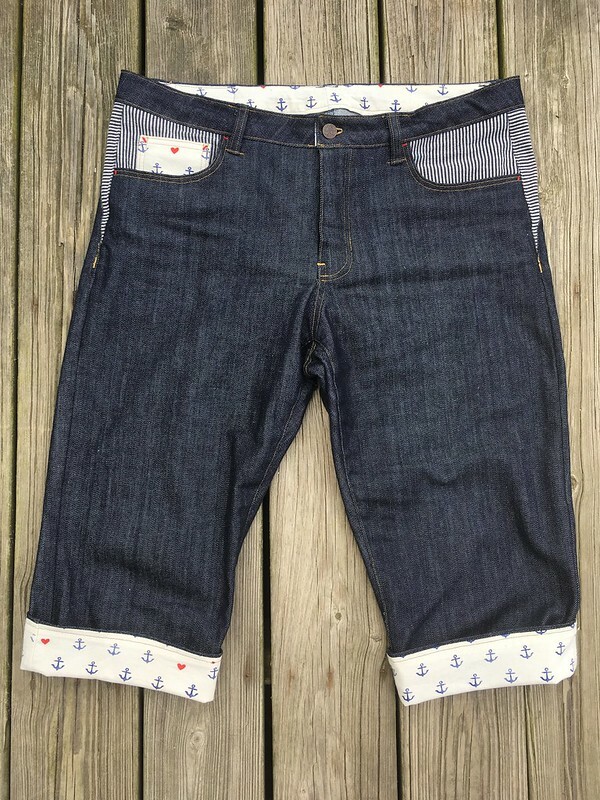 Not only was my denim left over from other projects, so was the anchor fabric (I used it to make this shirt) and the striped fabric (I used the other side as my right side when I made the striped shorts in this post). I even used a leather scrap to make a little patch. Yay! As for the pattern itself, I liked it, and would make it again. 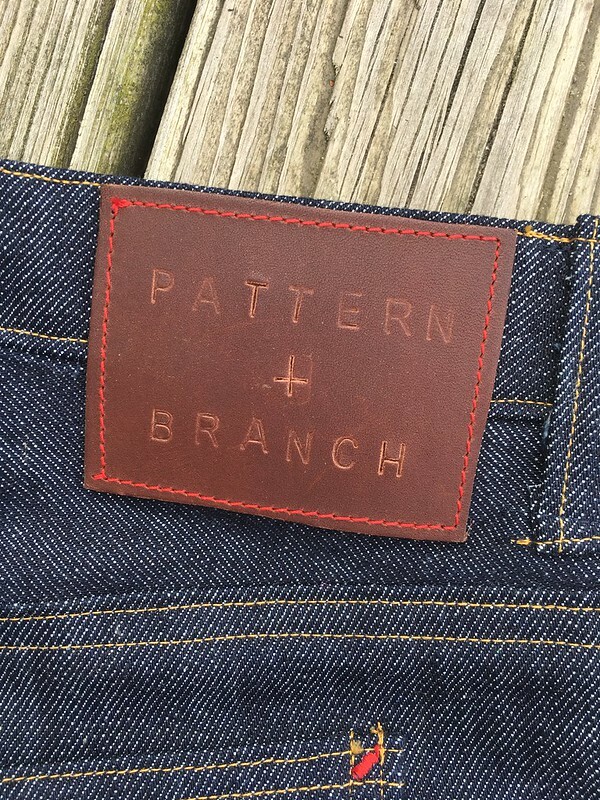 I like the button fly, which is different from other jeans that I have, and the comfortable fit (once I got the sizing right).